After careful consideration by a distinguished panel of judges, OMiG are proud to announce the 2017 Digital Marketing Awards finalists. Please visit www.galwaymarketing.ie/awards to reveal the full list of nominees and finalists. All finalists are invited to a Master Class on Friday 26th May, on the day of the awards. This will be made up of two Digital Marketing focused workshops; one with Gareth Dunlop, Fathom and the second with Kevin Moran, IMS Marketing. The Master Class will include insights on how to apply for the LEO Digital Voucher Grant worth €2500, and AIB will also be offering up their SME Tool Pack for some lucky winners. 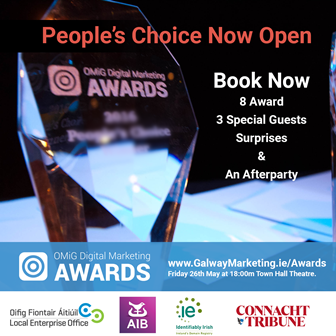 Voting is live for the People’s Choice Award, where you the public get to choose your favourite Galway Digital Marketing guru. Please remember that the nominations are open until Wednesday, 24th May at 23:59 via the OMiG website.